Any way here is the news clipping from Indian Express. 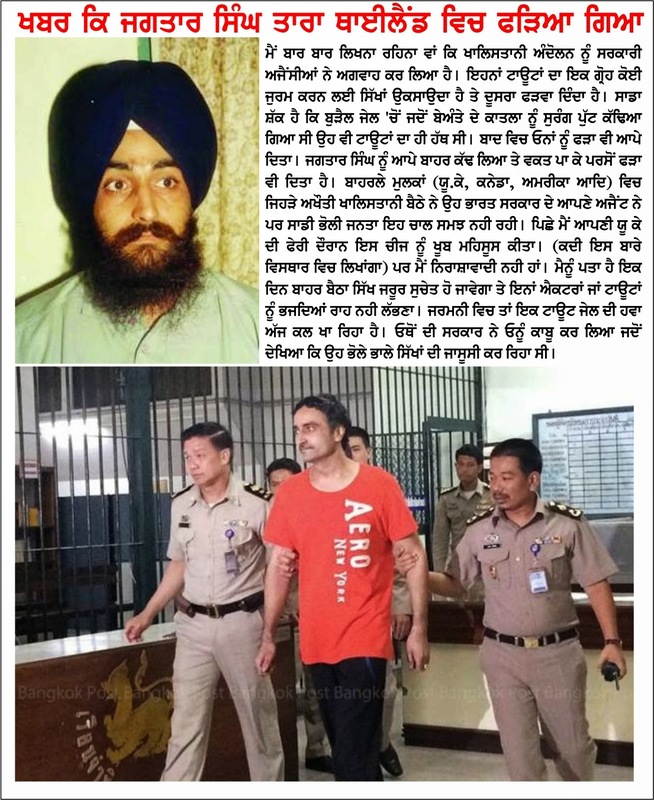 CHANDIGARH: In an international operation former Punjab Chief Minister Beant Singh's assassin Jagtar Singh alias Tara was arrested in Thailand by Thai Police on a tip-off on his movements given by the Punjab Police after he had escaped from High Security Burail Jail ten year ago. Sources said that the most wanted sikh militant was arrested from the house of Bari in Phuket, who is said to be a brother of Sultan Bari, a Pakistan-based agent of Pakistan's Inter Service Intelligence (ISI). He was living under a fake name as Gurmeet Singh son of Kaka Singh on a Pakistani passport. He june last year he had moved to Thailand from Pakistan as before that he had been living in Pakistan after he had escaped from the high security jail here via Nepal. A Punjab Police team had gone to Thailand in September for three weeks and later in November another police team was sent to arrest Tara but he had gone underground. “Tara is in the custody of the Thailand police and we will be completing all formalities to bring him back here as soon as possible,’’ said a senior Punjab police official. Tara who was self-styled commander of Khalistan Tiger Force was one of the masterminds in the assassination of Beant Singh by a human bomb outside Punjab Secretariat in Chandigarh on August 31, 1995. Besides Beant Singh, 17 others had lost their lives in that blast. Tara and along with other assassins Paramjit Singh Bheora and Jagtar Singh Hawara with their accomplice Dev Singh had escaped from high-security Burail jail in Chandigarh in 2004 after digging 100 feet long tunnel from their barrack to outside the jail. While Hawara and Bheora were later nabbed from Nepal, Tara and Dev Singh had slipped into Pakistan. Dev Singh is still believed to be in Pakistan on fake name of Luck Singh. Reacting over the arrest, former Director General of Police KPS Gill said, " Punjab Police has done a good job. They have been after him for a long time." The suicide bombing was carried out by Dilawar Singh Jaisinghvala of Khalistan Liberation Force. Standby bomber Balwant Singh Rajoana was also convicted for the killing and later sentenced to death. However, various Sikh groups protests against sentence leading to the government staying his execution in 2012.